Be inspired with the perfect art for any healing space. Check out these hand-painted batiks from Bali! This skilled art form starts with wax outlining, then color blending, painting and shading. Finally the cloth is boiled in water to remove the wax, revealing the white lines of the traditional yogic symbology. The cloth is 100% rayon made in Indonesia. This durable material is easy to clean and care for. There is a loop at the top of each piece to place a curtain rod through for hanging. These batiks were made by our friends Wayan and Komang Tita in Ubud, Bali. Working directly with this couple, we can attest that it is fair trade and crafted with great care and love! The seven chakras are artfully depicted in these batik banners. The images and colors are derived from traditional yogic symbology. FREE SHIPPING! Click on images below to zoom in. 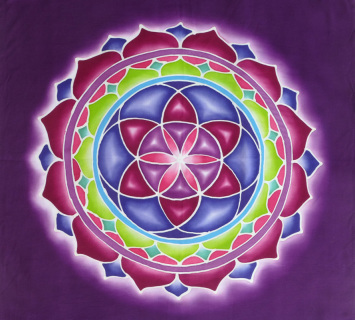 Chakra Banner - Large Purple - 10"x 61"
Handmade batik art from Bali. Chakra Banner - Large White - 10"x 61"
Chakra Banner - Large Green - 10"x 61"
Chakras on emerald green background. Chakra Banner - Small Purple - 6.5"x 42.5"
Chakra Banner - Small White - 6.5"x 42.5"
Sacred Geometry Batiks, for meditation and beautification. These beautiful designs come from classic sacred geometry. With roots in studies of natural phenomena, these images depict the underlying geometric structure of the universe. FREE SHIPPING! Click on images below to zoom in. *All sales are final. Seed of Life sacred geometry design. 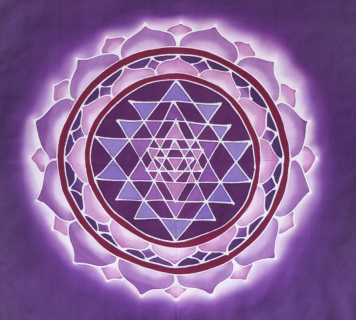 Sri Yantra sacred geometry design in purple hues. The "Seed of Life" is formed from seven circles being placed with sixfold symmetry. It represents the first building block of organized systems, leading to the flower of life and tree of life. It inspires creativity and manifestation. The "Sri Yantra" is formed by nine interlocking triangles that surround and radiate out from the central (bindu) point. It represents the meeting of Shiva and Shakti forces, and of heaven meeting earth. It can be used as an object of meditation, expanding focus from inward to outer levels, or conversely from the larger whole and inward to a single-pointed concentration. 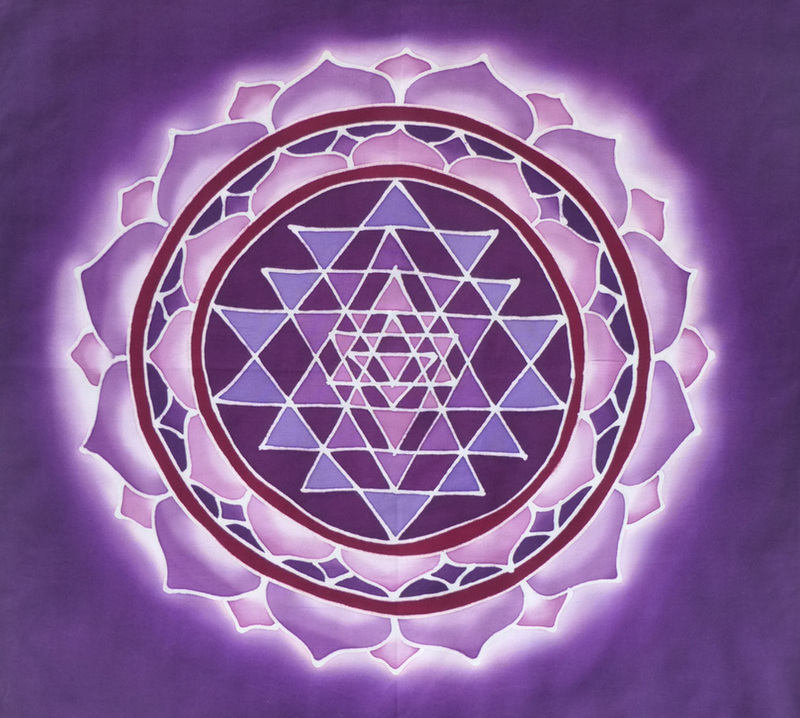 The Sri Yantra inspires thoughts and feelings of union, non-duality and focus.